What is the nature of dialectic according to Hegel? And what is achieved by its means? These are the main questions that John McTaggart (1866-1925) seeks to answer in this work, first published in 1896. At the beginning of the twentieth century, the Cambridge-educated philosopher and fellow of Trinity College enjoyed a prominent position within the circle of idealist philosophers, and was regarded as one of England's leading Hegel scholars. 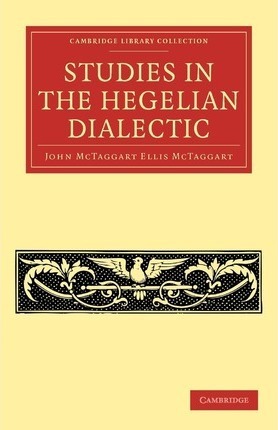 Although a proponent of the German philosopher's dialectical thinking in general, McTaggart was not uncritical of Hegel's philosophy and objected to his application of abstract thought. In this work, McTaggart not only gives the reader a thorough introduction to Hegel's understanding of the dialectic method but also exposes a number of points on which he considers Hegel's teaching to be inaccurate: one of these is Hegel's insistence that evil is merely a delusion. Preface; 1. The general nature of the dialectic; 2. Different interpretation of the dialectic; 3. The validity of the dialectic; 4. The development of the method; 5. The relation of the dialectic to time; 6. The final result of the dialectic; 7. The application of the dialectic.